Our first stop was Saint George, a small town Peter liked when he visited a year ago to race in the Saint George Half Ironman with our friend Dave. I was curious to see bits of the course for myself and wanted to know what Peter found so special about this place. 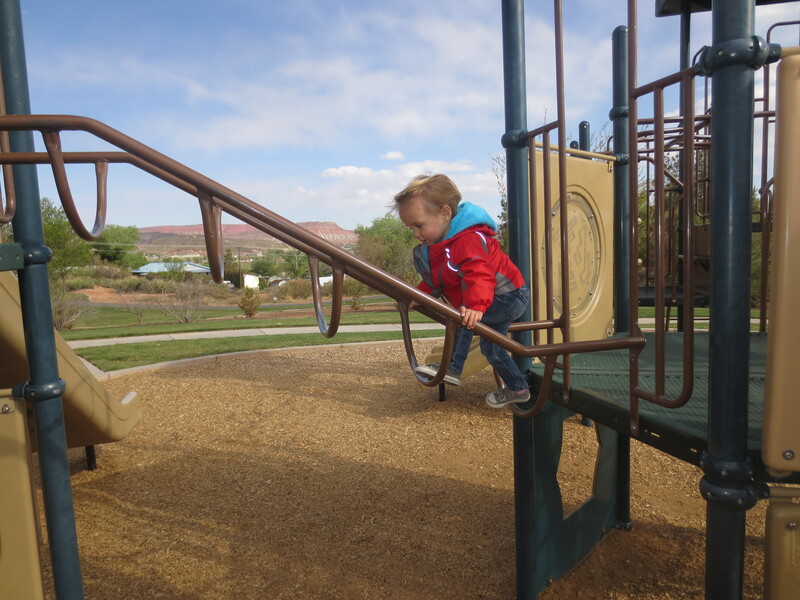 Don’t be fooled by the size, Saint George has a lot to offer. 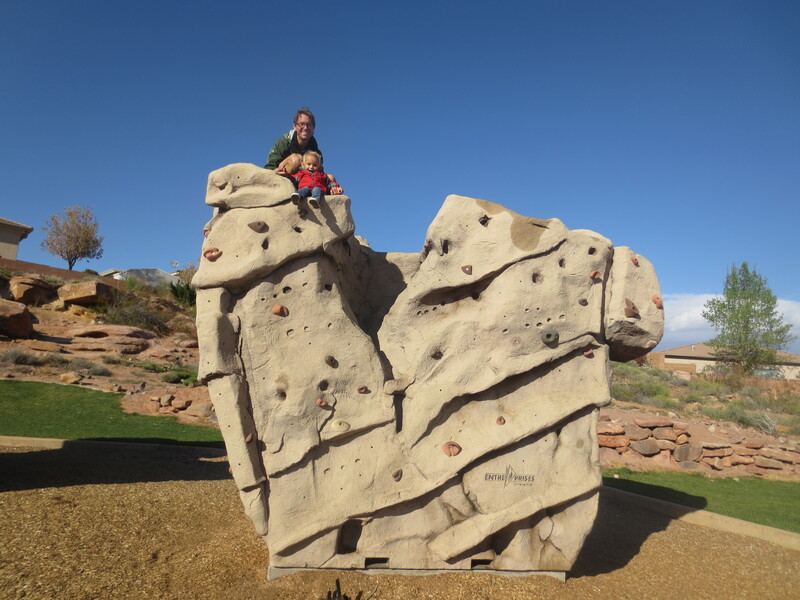 My favorite part of the city is that it has miles and miles of paved and unpaved trail systems making it the ideal place to get outdoors as a family. Running, biking and hiking, is accessible right from your doorstep! For real people… steps away! These fantastic trails lead in and out of the Saint George suburbs and also stretch into the isolated landscape of the surrounding desert. On the rare occasion there isn’t a trail heading in the direction you wish to travel, the roads are… like double the size of a normal road… and the small town air makes everyone a super slow driver. We both felt very safe with Sage taking the helm, in the Ibert. 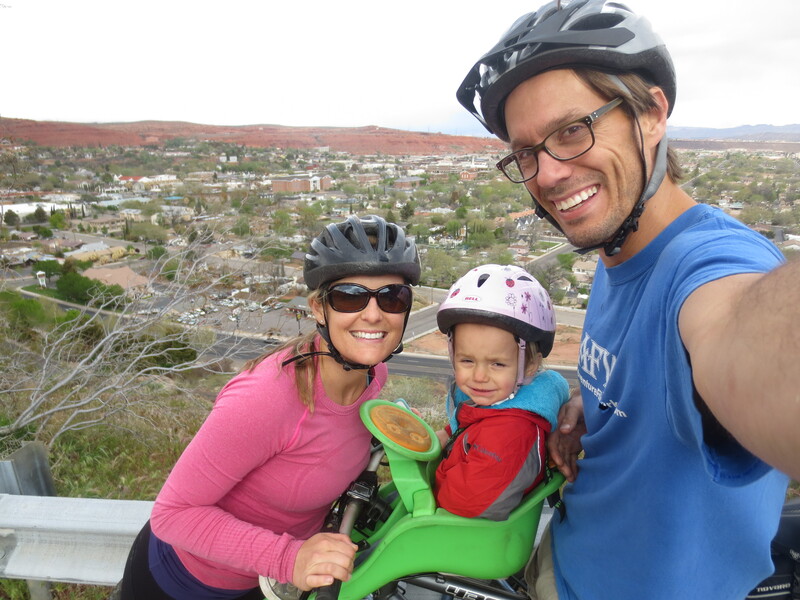 We dragged ourselves and that kid over 30 miles around town adding to the over 1,000 miles Sage has traveled in the Ibert, our favorite bike accessory ever. The start of our bike loop around Saint George. Peter riding with the climbing gear. During our ride we found The Bear Paw Café. A delicious diner-style restaurant that was one of the few places open on a Sunday. I think it was mostly delicious because they actually had twice baked potatoes on the menu. Yes there is nothing like a potato stuffed with mashed potatoes (and cheese)! 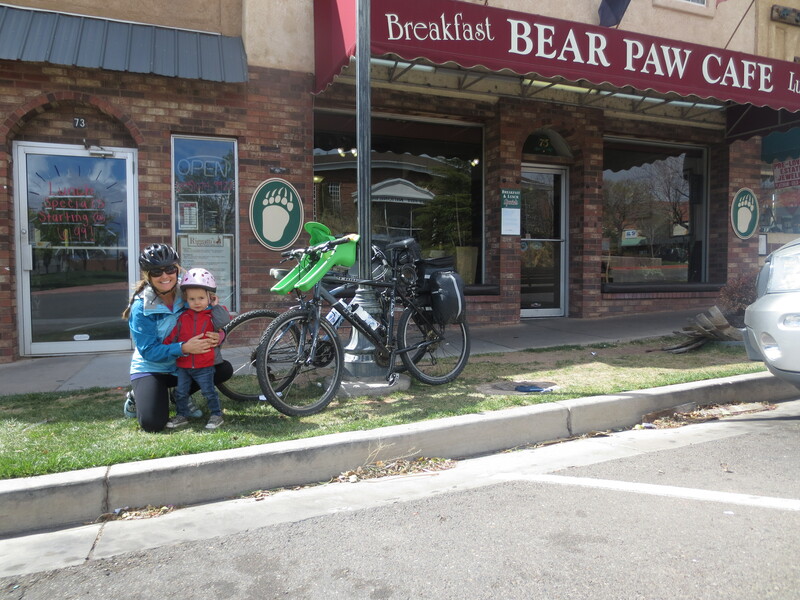 Bear Paw Cafe and our bike set up. 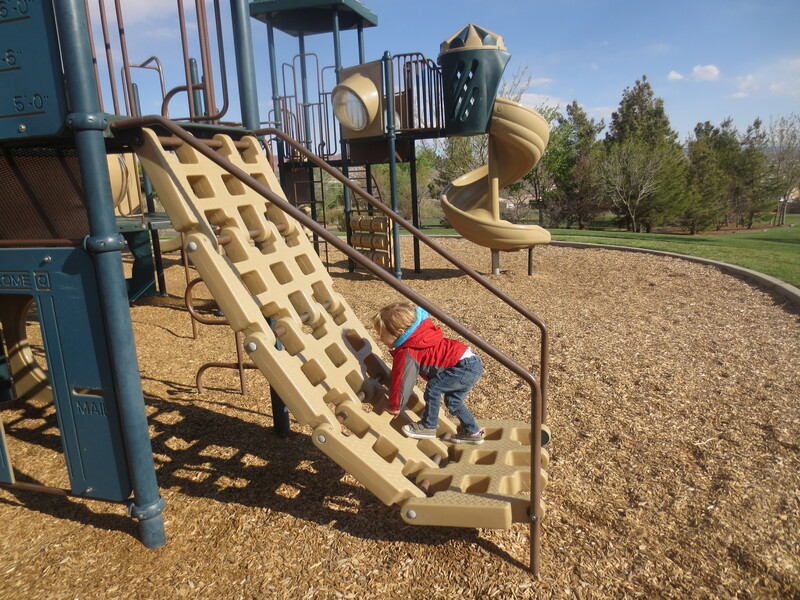 One of the best parts of traveling to new cities with a toddler is finding awesome new playgrounds! 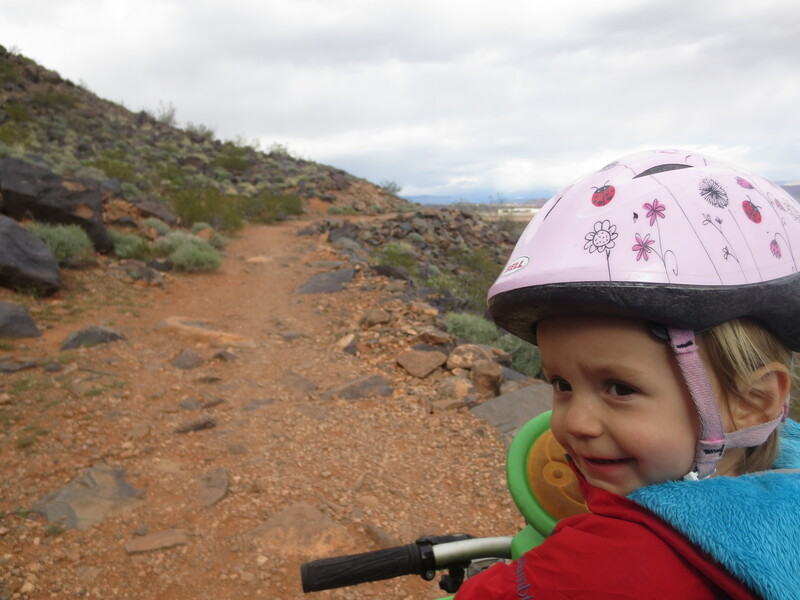 On our bike ride we rode Quarry trail. The spot where pioneers quarried volcanic basalt for the foundation and basement of the local temple. It is the original wagon trail built to haul out the rock. There are beautiful views of Green Valley and Snow Canyon in the distance. It’s pretty much a beginners route as I am in all definitions of the word a beginning mountain biker. But there were some more technical moments if boulder hopping on a bike is your thing. Not my thing… I walked over those bits. 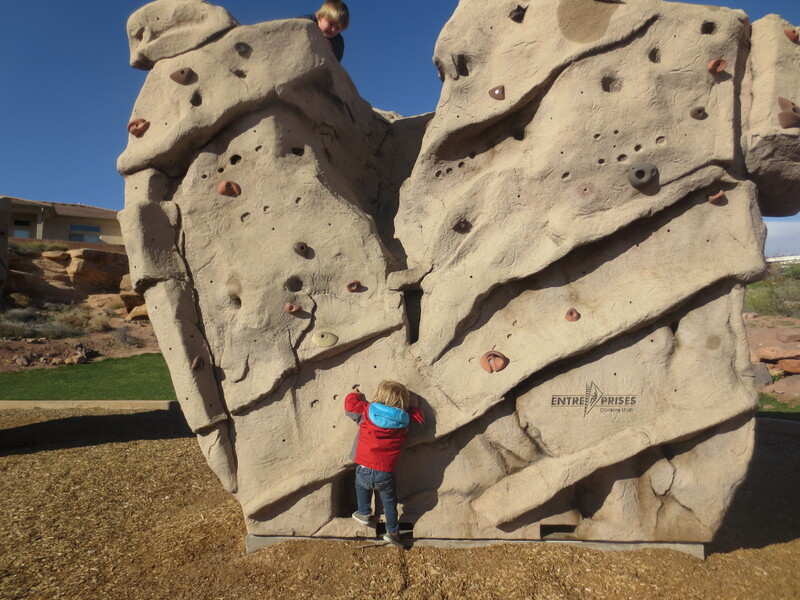 Another awesome feature of this town is the outdoor bouldering area at Slick Rock Park. It doesn’t take long to realize that the emphasis to get outdoors is strong in this town. Especially when the highlight of our trip was riding our bikes from our hotel and straight to a fantastic rockclimbing area called Chuckawalla Wall. Tell me please, what is better than biking to climb?! 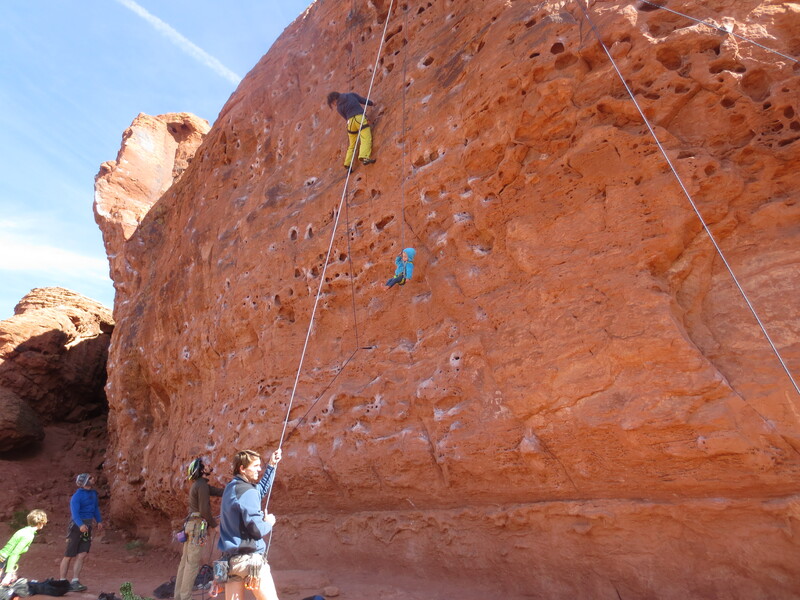 This crag is the ideal place to climb with small children in tow. Sage was free to run around at the base and we didn’t have to worry about her falling off a ledge or sliding down the side of a steep mountain. For those of you that don’t rock climb, I am not joking. These are serious concerns of mine when we visit other crags. The most trouble Sage could get in at Chuckawalla was rolling in too much dirt. On our way back from biking to Chuckawalla we found a delicious restaurant called 25 Main They offer a wide range of healthy creative lunch and breakfast options, awesome coffee, and delicious cupcakes. I had a hard time deciding what to order. Stopping at this restaurant is a must. But make sure to ask before you show up looking for discounted cupcakes. They don’t start giving them away until at least 5:00pm. And, as if the town could get any better, it also has a children’s museum unfortunately we didn’t have time to check it out but on our next trip this will be a stop for sure. 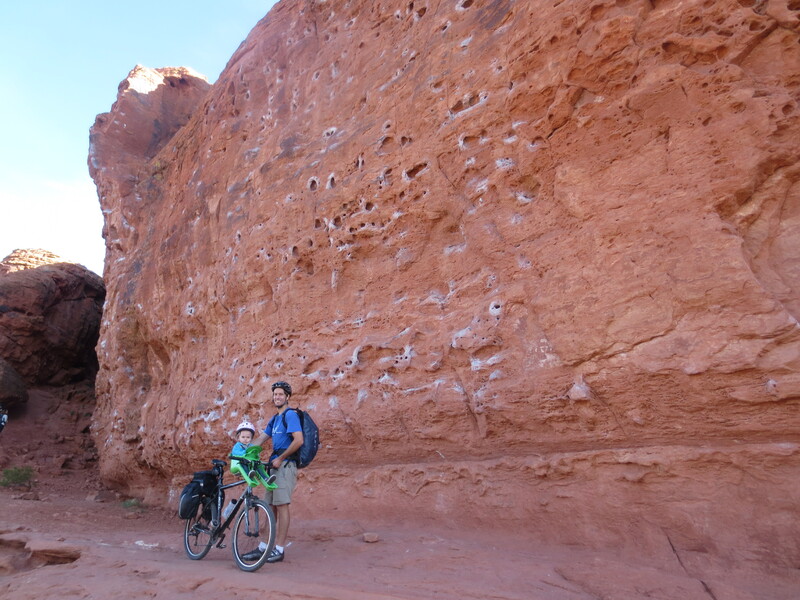 Saint George is a great overnight to two-day stop but I wish we had a little more time. Peter and I both would like to make the city a three or four day weekend destination. There is just so much more climbing, biking, and hiking we want to explore. 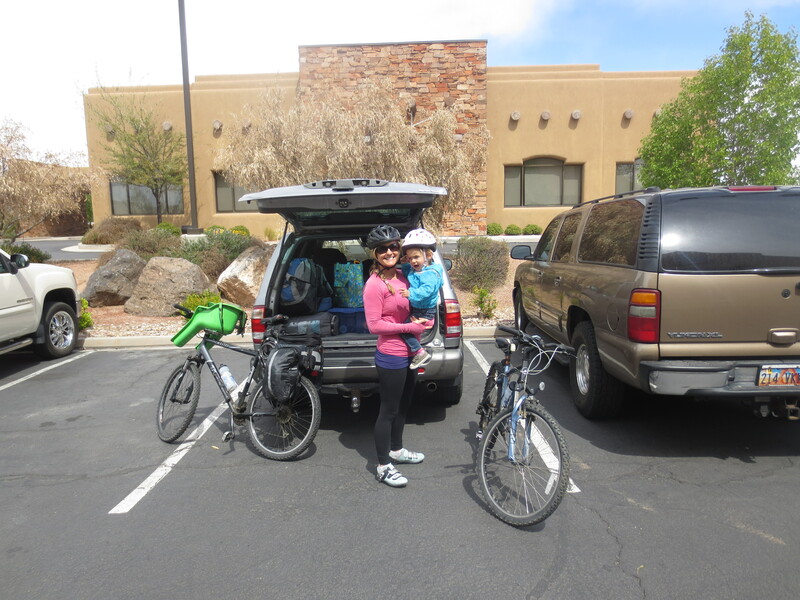 This entry was posted in bike touring, Biking, Roadtrips, Rock climbing, US travel, Utah and tagged biking, ibert, road trip, Rock climbing, Saint George, travel, travel with toddlers. Bookmark the permalink. 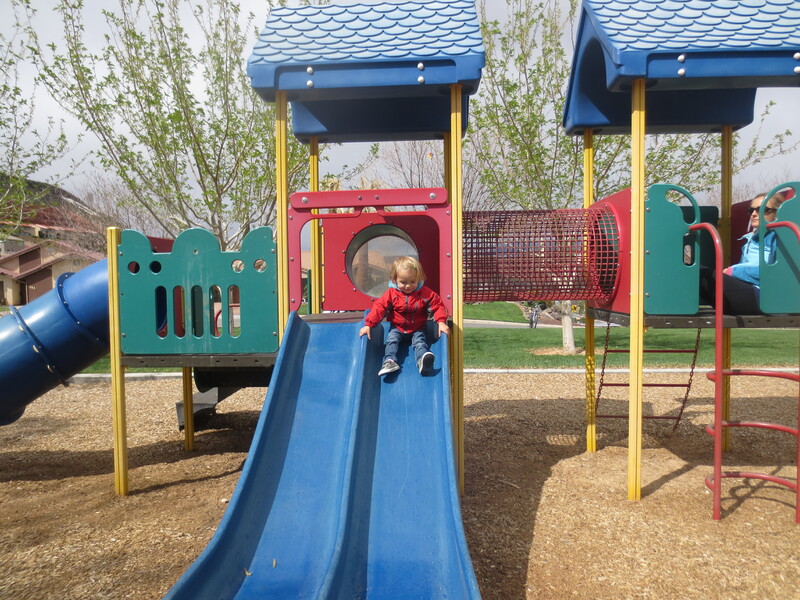 Pingback: Utah is for toddlers!